A few takeaways from each of the three Thursday night games in the Big Sky. - This was a chance for the Bears to take a big step in their growth and maturity, but they couldn't do it. They got off to a great start, getting a 12 point lead in the first half, but they could not sustain it. Montana led by one at the break, and then blew the Bears out in the second half. - Will Cherry was the man in this game, with 27 points (17 in the first half), six assists, and four steals. He was a level (or two) above anyone UNC had on this given night. 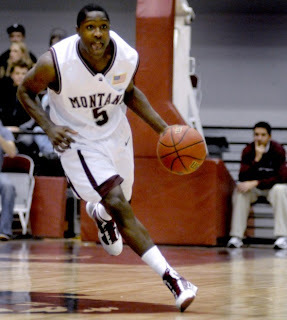 - Still would like to see Montana's freshmen (especially Keron DeSheilds and Kevin Henderson) get some more run, but it is tough to question Tinkle - he has proven himself well. - Weber State showed how dangerous they can be and how many weapons they have. Damian Lillard had 18/6/6, but Kyle Tresnak was the leading scorer with 22 points. Playing against NAU's front line, it was a nice game plan by the Wildcats to get the ball down low. - Northern Arizona shot 53% from the field, but they still weren't even that close in this game. It didn't help that leading scorer James Douglas missed the game with an illness. Hopefully he can return quickly. - Weber State is now 11-0 at home. That is a scary thought since as of now, both the semifinals and finals of the Big Sky tournament would be played in Ogden. - I keep doubting how good Montana State is, and they keep winning. Sure, they have benefited from a nice schedule in the early going, but there is something to be said about winning the game that you're supposed to win. That is what the Bobcats have done this conference season. - As they have done this year, MSU hit some big free throws down the stretch. - Finally a nice scoring effort from Sac State guard Dylan Garrity! He led all scorers with 18 points, and even knocked down three treys. He has been a nice playmaker for the Hornets, but has struggled mightily with his shot. - If Montana State can beat Northern Colorado at home, they will improve to 5-2 in the Big Sky, another strong start. Suffice to say that MSU fans have seen this movie before, but they hope that this time around it has a happy ending.